The increasing need for space to fit the demands of a growing family and their guests was the catalyst for transforming this 1977 villa in the German city of Offenbach into a modern family home. Karsten Huneck and Bernd Trumpler of KHBT Architects have bases in both Berlin and London, and took on the project to create this striking 320 sq m split-level structure. A newly built storey atop the existing building and an extension at ground level add extra floor area – making room for an additional bedroom and bathroom, a larger kitchen and a dining area. The form of the original house has been retained but complemented by a contemporary folded roof structure, angled on the north-south axis and pointing towards the sky. An internal triple-height staircase acts as a circulation hub, leading off to various rooms within the house. 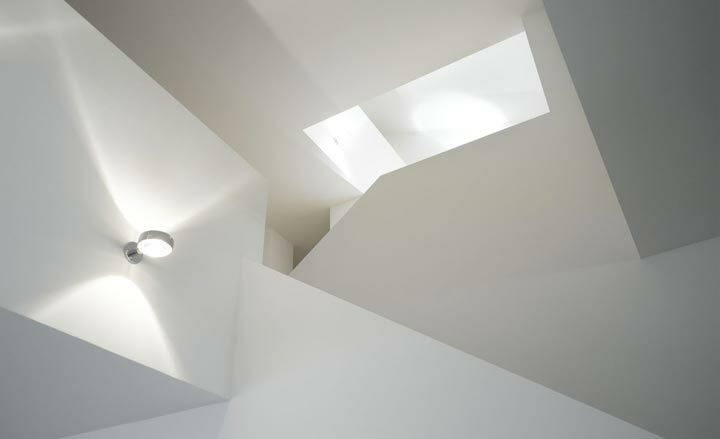 The flight of steps is illuminated by a roof light installed above the stairwell, filtering daylight in and brightening the surrounding spaces. The brilliant white interior features built-in timber elements that include the steps, furniture and flooring. The concept for the striking façade was inspired by the rain screen that used to cover the building. Now, the new and improved dwelling showcases a fully insulated and waterproof wall of vertical timber strips, intricately arranged on an irregular grid. It was engineered by KHBT and ’achieved through a thorough process of design’, explains Huneck. The thin timber fins have been coated with a newly developed mineral-based paint by German company Keim, which allows the timber to breathe while simultaneously keeping it protected. Combining traditional practices with innovative ideas, KHBT has successfully transformed an ageing design into an updated, modern home fit for the 21st century.